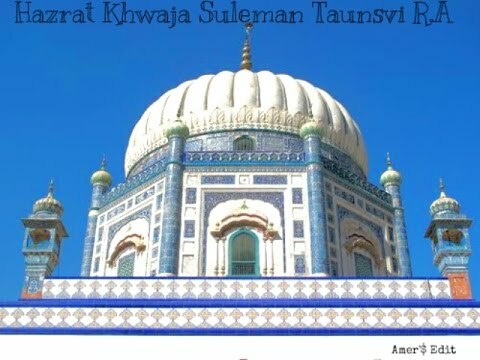 Name and Lineage: Hazrat Khwajah Allah Bakhsh Taunsvi son of Hazrat Khwajah Gul Muhammad son of Hazrat Khwajah Shah Muhammad Suleman Taunsvi son of Muhammad Zakariya son of Abdul Wahaab son of Umar son of Khan Muhammad رحمۃ اللہ تعالٰی علیہم. Birth: He was born in Taunsa Sharif in the month of Zul-Hijjah, in 1241 A.H/ 1826. Acquistion of Knowledge: Hazrat Khwajah Shah Muhammad Suleman Taunsvi handed over his grandson to Maulana Muhammad Ameen for acquiring religious knowledge. He taught the Persian literature and Arabic grammar (Sarf-o-Nahw) besides the holy Quran. Then he gave lesson of Hadith. Hazrat Peer Pathan himself gave him the inward training. Character and Qualities: He used to live in a splendid way in the beginning. When he held his real status, then he started wearing an old cap, blue waist piece (tehband) and ordinary dress. He got the love of prayer (Namaaz) and fast (Rozah) through the training of his grandfather since childhood. With the passage of time his inclination towards worship reached the end. He used to instruct to his disciples and devotees to keep away from all the kinds of bad faiths and misleading movements. When Mirza Ghulam Ahmed Qadiani started publicizing his beliefs, then he would strictly refute them by sitting on his place and he tried to awake the religious feelings of Muslim so that they might not inspire with this kind of misleading movements, although he(Mirza) did not claim of Nubuwwat (Prophethood) yet. He had good manners. Along with genealogical nobility and dignity, he attained the nearness of Almighty Allah by going the forefront in worship. Once, Hazrat Peer Mehar Ali Shah Golarvi رحمۃ اللہ تعالٰی علیہ said, “In the view of Khwajah Allah Bakhsh, people of world did not have the value equal to particle. He was very pro-poor. He quite despised the worldly people. We did not see or hear any saint like Khwajah Allah Bakhsh.” May Almighty Allah grant them (contemporary successors) the privilege to follow the way of Auliya-e-Kiram رحمۃ اللہ تعالٰی علیہم . Ameen! Allegiance and Caliphate (Khilafat): When the last time of Hazrat Khwajah Muhammad Suleman Taunsvi came near, then he requested by placing head on the blessed feet of Khwajah Suleman, “I am not asking for anything but I want just pay the service of your devotees.” After listening that a condition overwhelmed on Hazrat Sheikh and he said, “ونفخت فیہ من روحی”, then he passed away. Demise: He passed away in 29 Jamadi-ul-Awwal 1319 A.H/ 13 September 1901 A.D. His shrine is in Taunsa Sharif.